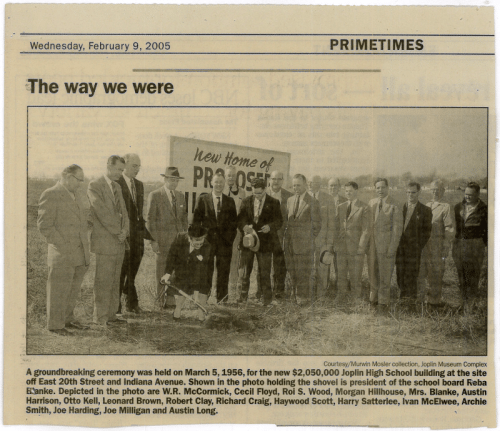 A groundbreaking ceremony was held on March 5, 1956, for the new $2,050,000 Joplin High School building of the site off East 20th Street and Indiana Avenue. Shown in the photo holding the shovel is president of the school board Reba Blanke. Depicted in the photo are W.R. McCormick, Cecil Floyd, Roi S. Wood, Morgan Hillhouse, Mrs. Blanke, Austin Harrison, Otto Kell, Leonard Brown, Robert Clay, Richard Craig, Haywood Scott, Harry Satterlee, Ivan McElwee, Archie Smith, Joe Harding, Joe Milligan, and Austin Long. Joplin Industrial Electric was founded in 1946 by Austin Long, my grandfather, with a belief in strong work ethic and a stronger belief in God. Today, almost 70 years later, we at Joplin Industrial Electric continue to hold those values true to our heart. We believe you are only as good as the quality of work that you put together. Because we hold such high standards of quality we hire only the most qualifying candidates. Each member of our team of electrical contractors is licensed and has years of experience. At JIE we strive to keep the best employees and equipment that we can. We see that our electrical contractors stay up to date with the latest technology by continually undergoing trainings. We know that when a member of Joplin Industrial Electric meets with our clients they feel confident in the work they will perform. Staying true to our core beliefs we strive to keep up with the ever-changing world in which we live in. We want to insure our clients are receiving the best quality of work possible. We hope you will let Joplin Industrial Electric and our team of electrical contractors continue to be your prime electric provider for many years and generations to come. Our gratitude goes out to the loyal customers and the future customers of Joplin Industrial Electric. We have many services we offer so if you have any questions please contact us!